Alistair Goodwin took advantage of the light winds at Farmoor Reservoir to sail his Laser to victory at the final event of the GJW Direct SailJuice Winter Series. 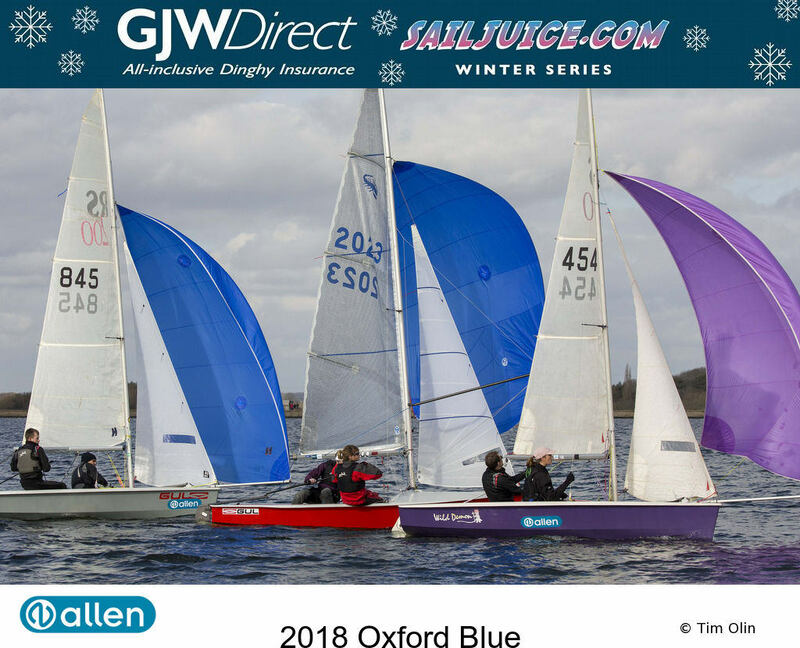 Alistair Goodwin has steered his Laser to glory at the Oxford Blue, the final of seven events in this season’s GJW Direct SailJuice Winter Series. The light winds, which barely blew over 8 knots, suited Goodwin’s Laser although in race one it was Nick Orman from Castle Cove who helmed his Phantom to handicap victory ahead of Ian and Gemma Dobson’s GP14 from SMVC and Charlie Sansom from Bowmoor in his RS Aero 9. SailRacer GPS Tracking Goodwin only managed 7th in the opening race but then the Haversham sailor hit his stride in race two, winning on handicap with Andrew Snell piloting his K1 keelboat to second place ahead of another Laser, Ben Flower in 3rd. Ben Schooling managed a 4th place in this race, although this would prove to be the high point for the Musto Skiff sailor from Stokes Bay, who really needed more breeze to stretch his legs over the hiking boats. In the final race, Goodwin again took the corrected time victory, this time ahead of Lawrence Creaser’s Solo and the Wayfarer sailed by Andrew and Tom Wilson who placed third. A huge turnout of RS Aeros meant there was a big class battle going on, making it very hard for anyone to break clear and score a consistent set of results. A trio of Aeros finished very close on points in 11th, 12th and 13th overall, with RS Aero 9 National Champion Pete Barton just pipping arch rival and reigning RS Aero 7 World Champion Steve Cockerill by a point, with Charlie Sansom a point behind Cockerill. Goodwin’s two race wins gave him the overall prize by a comfortable margin, with Creaser second, Snell third and the Wilsons’ Wayfarer first of the doublehanders in fourth overall. As is often the case, many classes had a sniff of the front at some point during the day, with eight different types of boat in the top 10, the Laser and Solo being the only classes to get two finishers in single figures. The official prizegiving takes place on Saturday 3rd March at the RYA Dinghy Show. Series organisers Andy Rice and Simon Lovesey will present the highlights from this Winter, with a vast array of prizes to be awarded across the numerous categories. The prizegiving will start promptly at 1030am on the Saturday, soon after the doors open. It takes place at the Class Association Stage, which you can find by heading in the direction of the big organ. Book your RYA Dinghy Show tickets now. GJW Direct’s ‘All-inclusive Dinghy Insurance Policy’ offers outstanding premiums, taking the worry out of dinghy sailing and racing. The website, gjwdirect.co.uk/dinghy , offers the facility to get a quick quote and immediate on-line cover. This policy can be arranged by phoning GJW Direct on 0151 473 8000.